Of all of the Jewish peoples residing in Europe during the Diaspora, it is fair to say that none had quite so eventful a history as the Jews of Hungary. Located at the crossroads of many empires, peoples and religions, no other group of Jews suffered as much virtually continuous persecution throughout their history. By the same token, no other group of Jews in Europe resisted persecution so fiercely and successfully. It is possible that these centuries of opression and resistance helped to prepare the Jews of Hungary better than their neighbors for the horrors of the Holocaust. It is therefore perhaps a fitting tribute to the resilience of the Hungarian Jews that Budapest is home to the Dohany Street Synagogue, the largest and one of the most beautiful surviving synagogues in Europe. 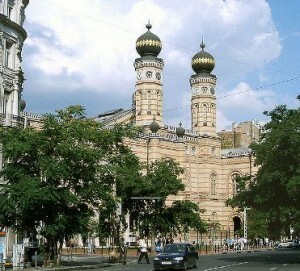 The Dohany Street Synagogue is part of the Budapest UNESCO World Heritage Site. The origins of the Jews of Hungary are a bit of a mystery. Historically speaking, they probably arrived around the same time as the Jews arrived in Poland, Bohemia and other eastern states. However, there are also theories that a Jewish community existed in the Danube River area as early as Roman times. One legend suggests that the first Jews in the area were mercenaries who aided the Dacians in their wars to resist Roman expansion into the region. Another legend indicates that the Jews of Hungary were Khazars who migrated westwards, possibly in aggressive warbands. Both stories hint that the Jews of early Hungary were less than pacifist. The life of Hungarian Jews was almost schizophrenic. It seemed that once or twice in every generation a new king would ascend the throne, alternately embracing or opressing the Jews. During one period in the mid 14th century, the Jews of Hungary were expelled, readmitted, expelled again and readmitted again in the course of just a couple of decades. Under one ruler the Jews would be admitted to state high offices, and under the next they would be burned at the stake. In spite of this, the Jews of Hungary, more than in any other place, were generally more integrated into the greater community and considered themselves a part of the Hungarian identity. The attitude of the Christians towards the Jews in Hungary was mixed. Apparently the Jews were well tolerated in some areas, and utterly vilified in others. Persecutions continued, but because of their strong roots, anti-Semitism in Hungary was often met with vigorous protests, passive resistance, and sometimes even with force. On at least one occasion, the Jews of Hungary escaped deportation simply by ignoring the order to leave. The strange paradoxical existence of the Jews in Hungary continued right up until the 20th century. When Jews throughout Europe began enjoying the new rights and freedoms of the Enlightenment, things tended to remain more difficult in Hungary. And yet, fewer Hungarian Jews chose to leave for greener pastures. In the 1930s, no other country embraced German-style facism as strongly as Hungary. And yet the fascist, anti-Semitic Hungarian government vigorously resisted pressure from Adolph Hitler, largely protecting the Jewish population right up until the Nazi annexation in 1944. Nearly a third of Hungary’s Jews, including more than half of the Jews of Budapest, survived the war, a miraculous number compared to neighboring countries. Today there are more Jews alive in Budapest than in Poland, the Czech and Slovak Republics, the Baltic States, Austria and Romania combined. The grand Dohany Street Synagogue is a testament to the determination and grit of Hungarian Judaism. The Grand Synagogue of Dohany Street is the largest synagogue in Europe and was the largest in the world until it was surpassed by New York’s Temple Emanu-El in 1929. Completed in 1859, this mastepiece of Moorish-style architecture consists of an enormous walled complex that includes the synagogue, several memorial sites, the Hero’s Temple honoring those Jews who fought and died in World War I, a Holocaust Memorial, and he city’s Jewish Museum. The entire structure is an architectural homage to the synagogues of medieval Spain. The interior of the synagogue is breathtaking. Rows and rows of pews and two floors of balconies provide seating for up to three thousand worshippers at a time. The high vaulted ceiling rivals that of any Hungarian church. The synagogue’s organ, possibly the largest in any Jewish house of worship anywhere in the world, has been played by musical giants such as Liszt and Saint-Saens. The ark, located beneath the synagogue’s great dome, is massive, and decorated and crowned in gold leif. The current condition of the synagogue, which was heavily damaged in the war, is the result of extensive restorations that were completed in the 1990s. Budapest is home to a wealth of Jewish sites. Immediately next door to the Dohany Street Synagogue is the Budapest Jewish Museum, located on a site formerly occupied by the home of Theodor Herzl, the founder of Zionism. Also nearby is the city’s old Jewish Cemetery. The Budapest Jewish Quarter, located in the old ghetto district, is home to several beautiful old synagogues. There are also a number of commemorative Holocaust sites around the city, notably the Raul Wallenberg Memorial Park.